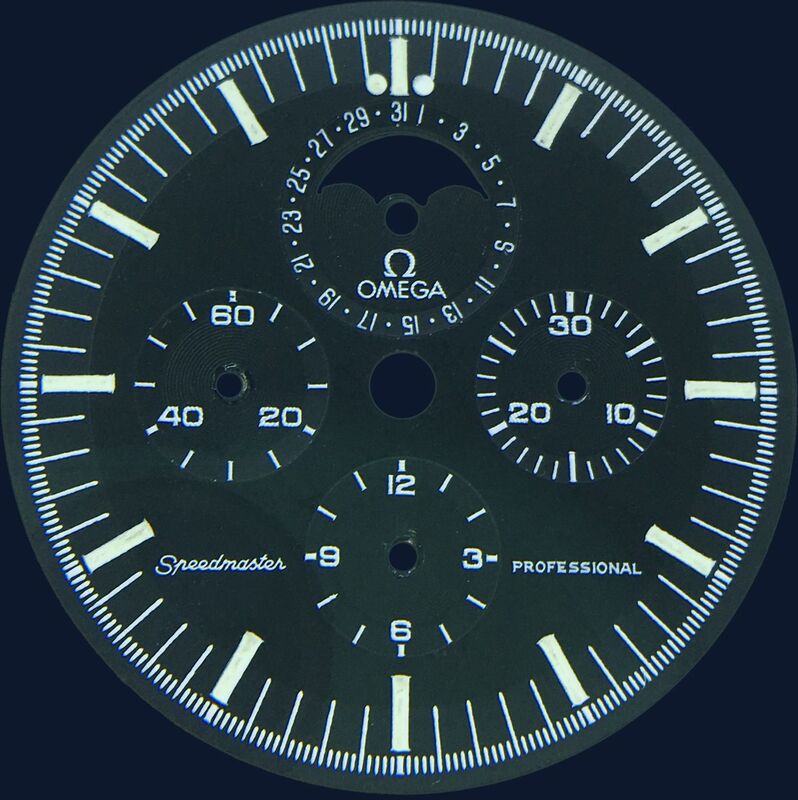 Although Moonphases had occurred in the Omega lineup prior to 1985 the Speedmaster Professional Moonphase 345.0809 was the first to be incorporated into the Speedmaster Professional line. 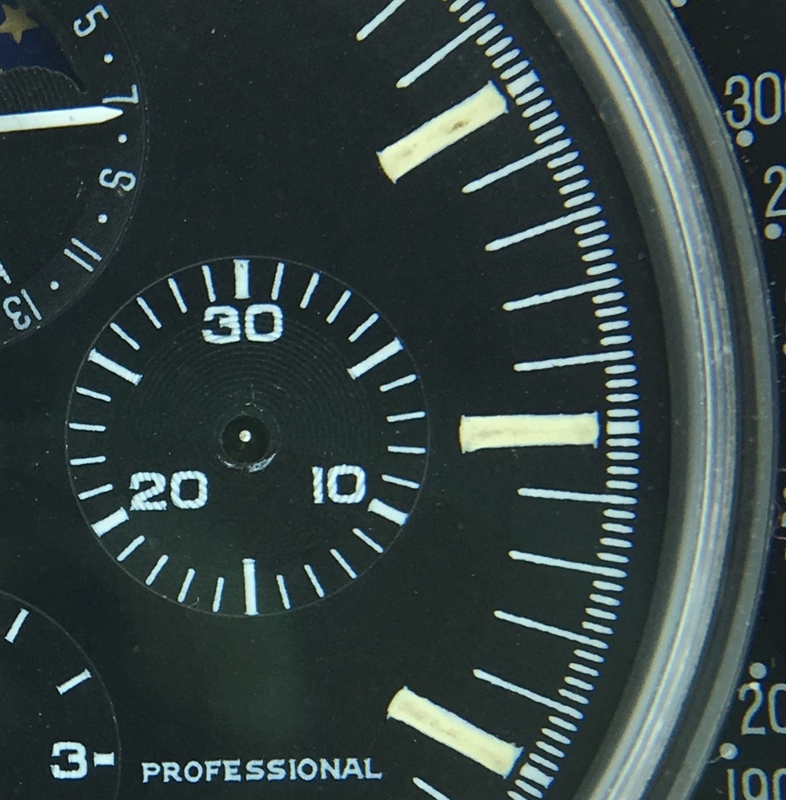 The watch was issued in November 1985 and in 1986 they introduced an additional redesigned version called the Smoothline Chronograph for the German market. The smoothline chronograph was cased in titanium with a flat sapphire crystal on a fully integrated bracelet TI345.0810 and also on a bi-metallic titanium and gold combination again an integrated bracelet TA345.0810. 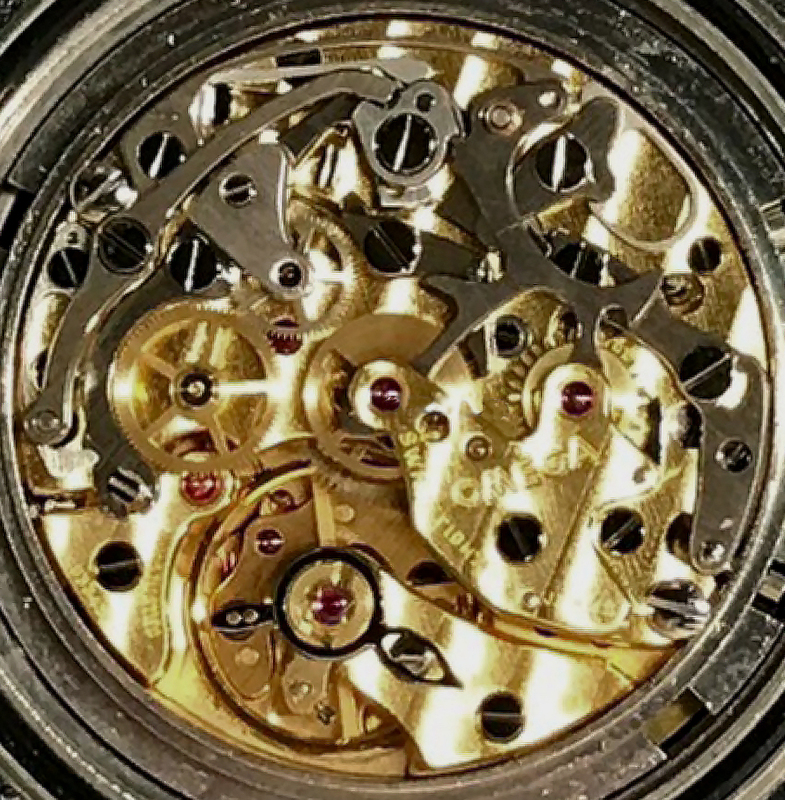 Out of a total of 2000 movements the Smoothlines in Germany had a limited edition release of 400 titanium examples and 300 bi-metallic gold and titanium examples. 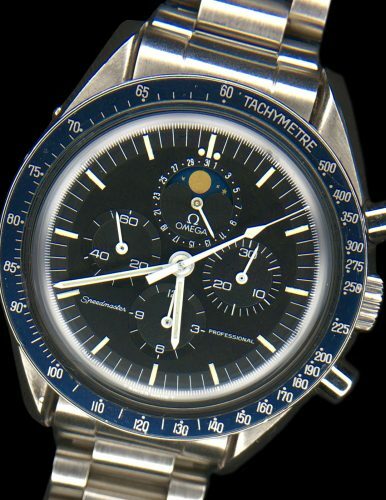 Of the 2000 in total there were only 1300 Speedymoons and it is further claimed that 15% were produced as strap-only model predominantly for Mexcio and some for Italy, leaving approximately 1100 in the configuration this site is devoted to. 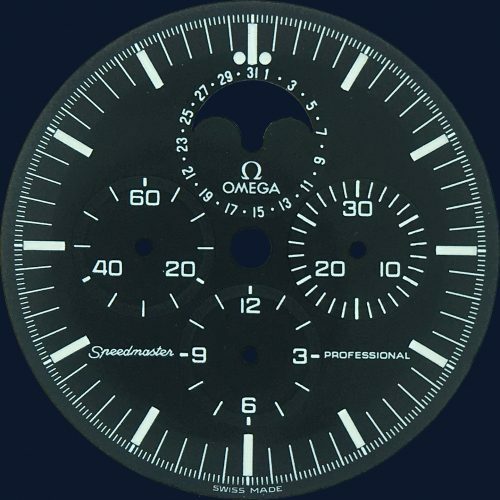 As far as is known production of all models ceased by January 1989. 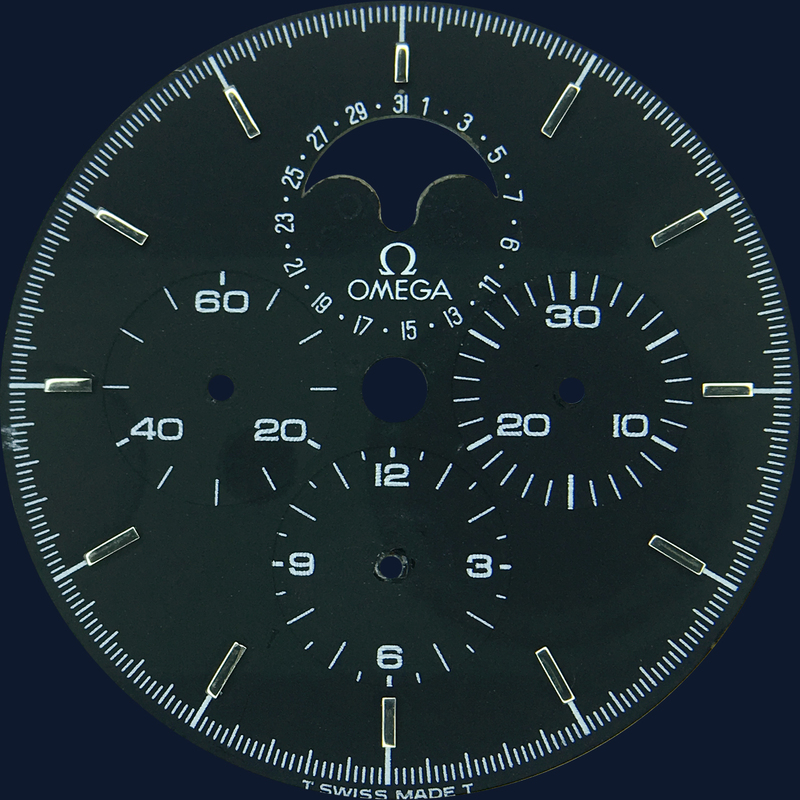 As with the Holy Grail the Moonphase features the standard B2 bezel with a narrow ‘C’. 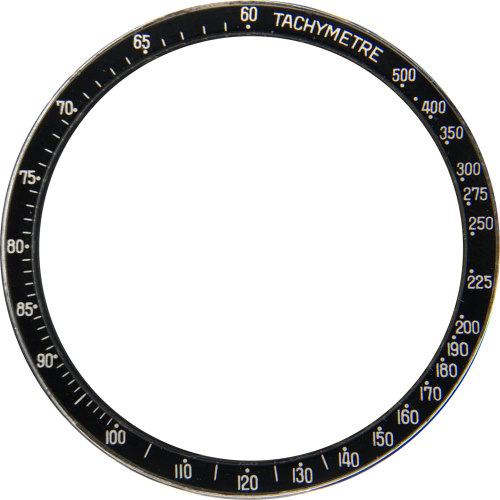 For some inexplicable reason these late batch B2 bezels appear to have a higher rate of colour degradation leading interesting variations. 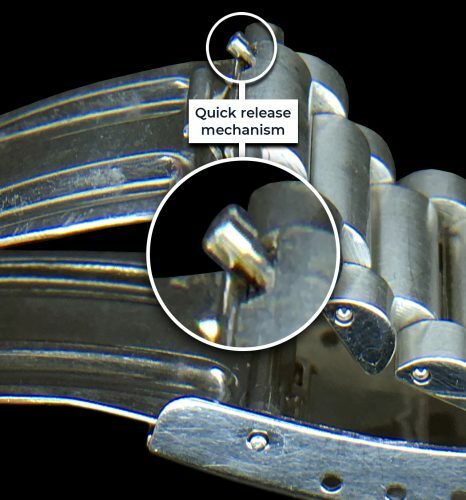 This is a very rare bracelet and is interesting for three reasons: it was the first bracelet with solid end-links, a lip on the clasp and to use the hidden quick-release (see picture below). 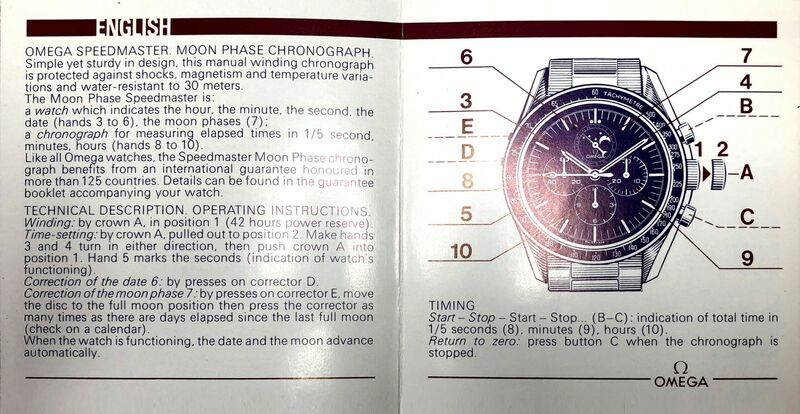 The early Speedymoon was one of the first watches on which this bracelet was issued from 1986 onwards. 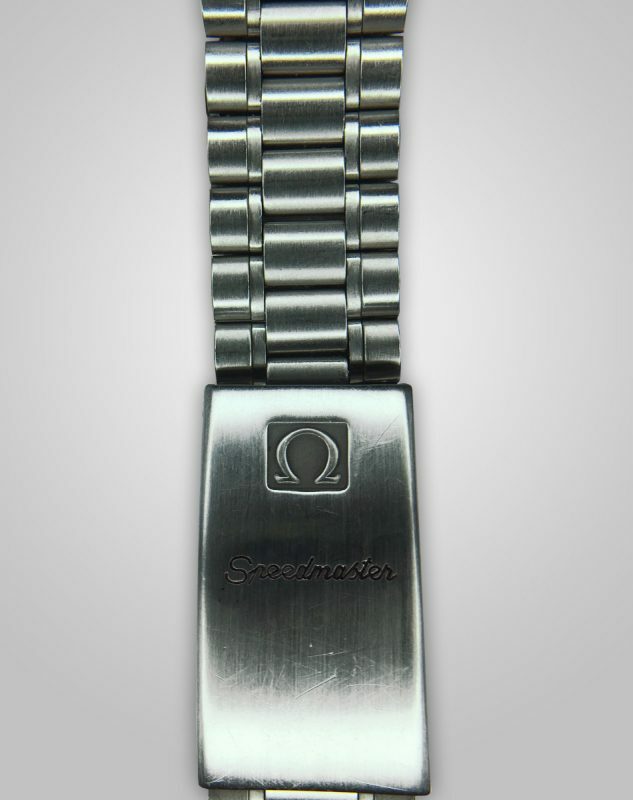 This bracelet came with 805 end-links. This is the replacement for the 1447 and is basically a big link version of the same and came with 808 and sometimes 809 end-links. 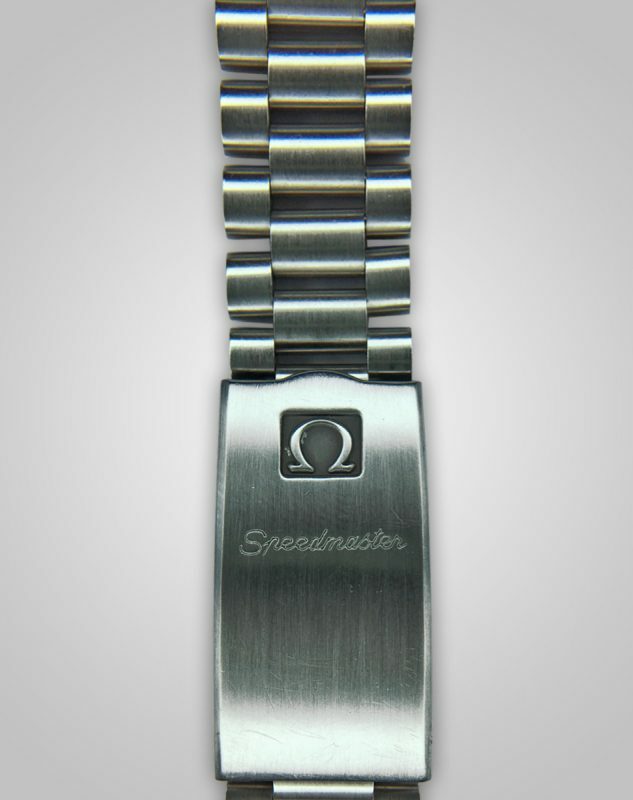 This bracelet replaced the 1450 in the final iteration of the watch in 1988-89. 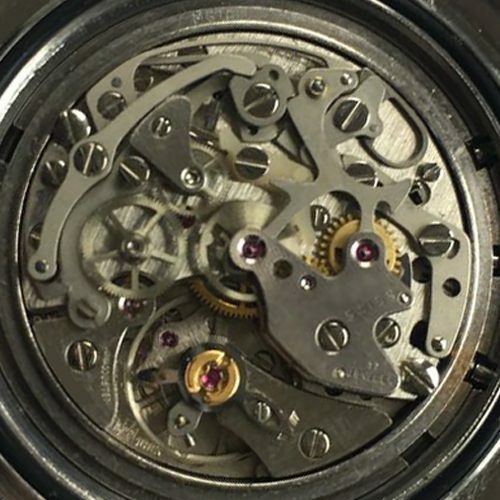 The quick-release feature was removed as was the lip on the clasp. 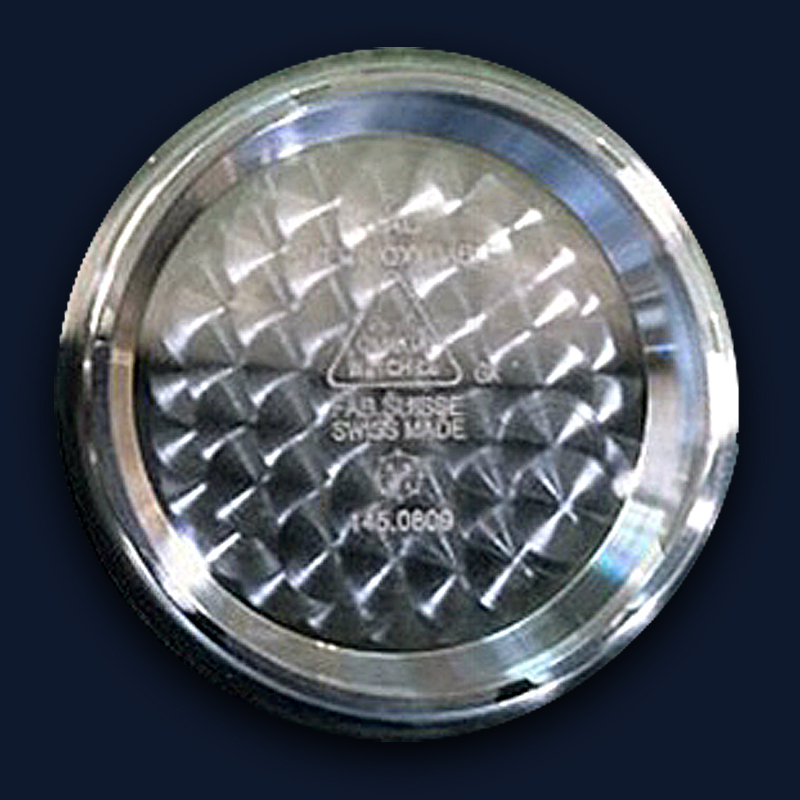 it carried 812 end-links. 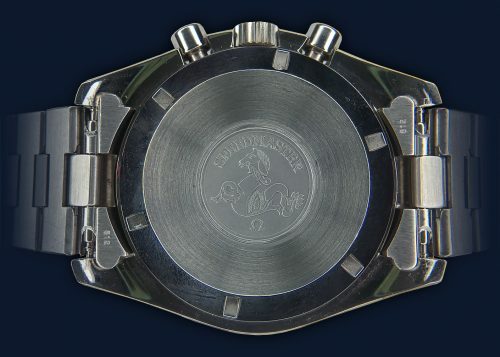 The case was made by Charles René Spielmann, who also made cases for the Rolex Daytona. 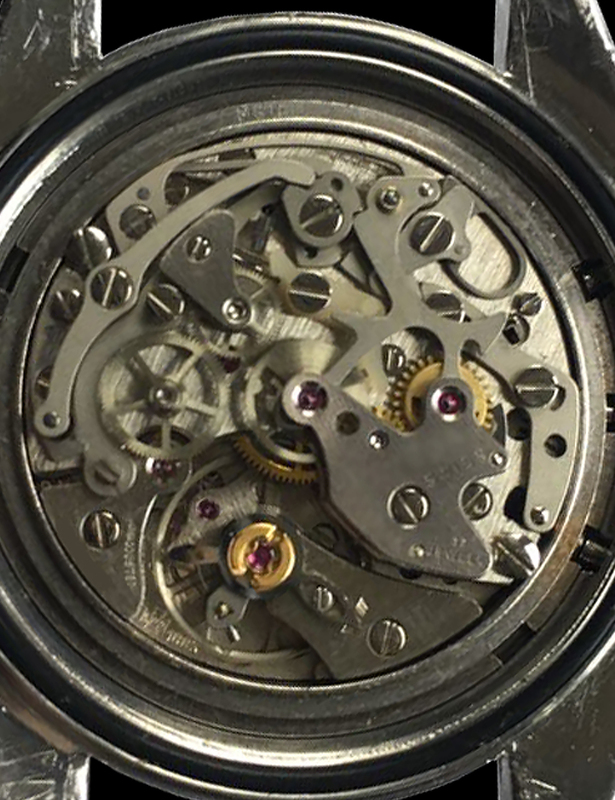 It was postulated that the case came in two versions however, the observed differences in this non-crown side profile, for example, have generally come about because of aggressive over-polishing. 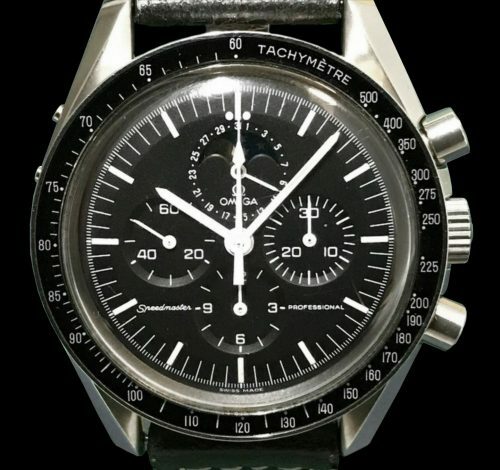 The cases are of a standard twisted-lug Speedmaster Professional style but with the introduction of date and moonphase adjustment pushers in the mid-case on the non-crown side. 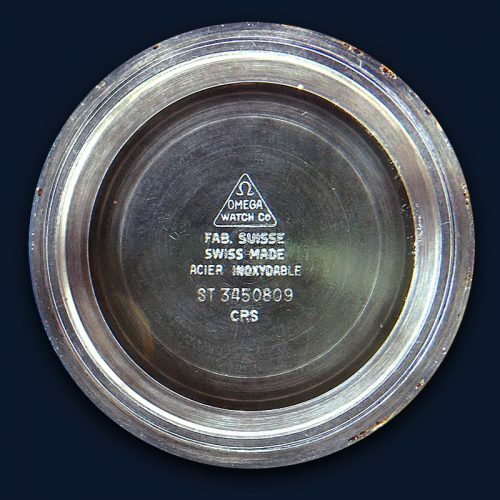 The case back has no NASA engraving, the same as the Holy Grail 376.0822. 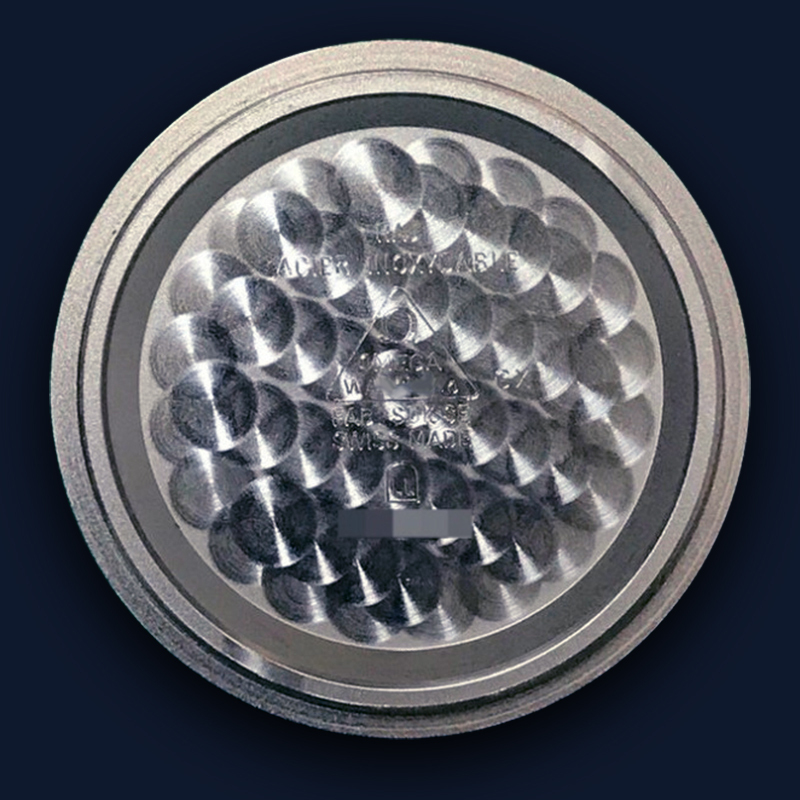 The glass of the Speedymoon is made from an acrylic polymer called hesalite. It’s a type 5 glass (no omega logo in the crystals centre) and only occurs in the following models 345.0808 20 anniversary limited edition, 376.0822 Holy Grail, 345.0809 Speedymoon. 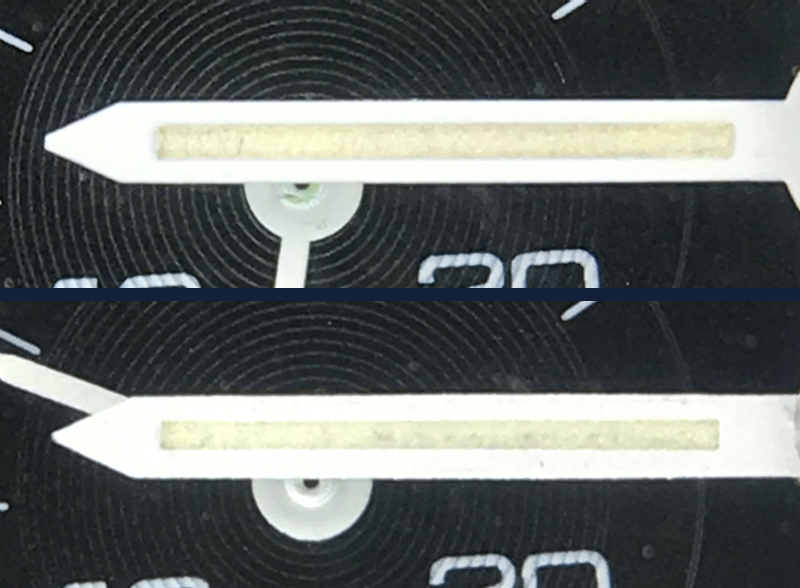 The zoomed in picture of the crystal on the left shows an embossed Omega symbol. 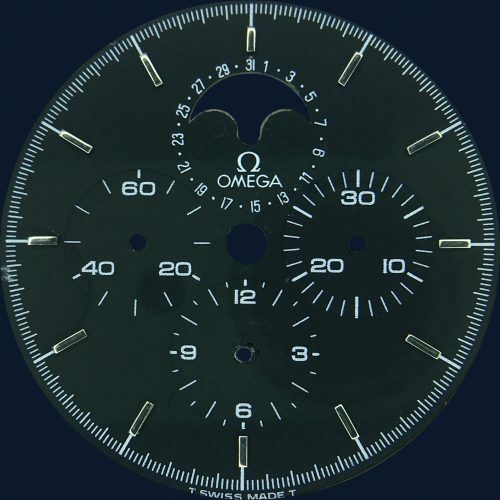 Whereas the crystal on the right does not feature the Omega symbol and is original. 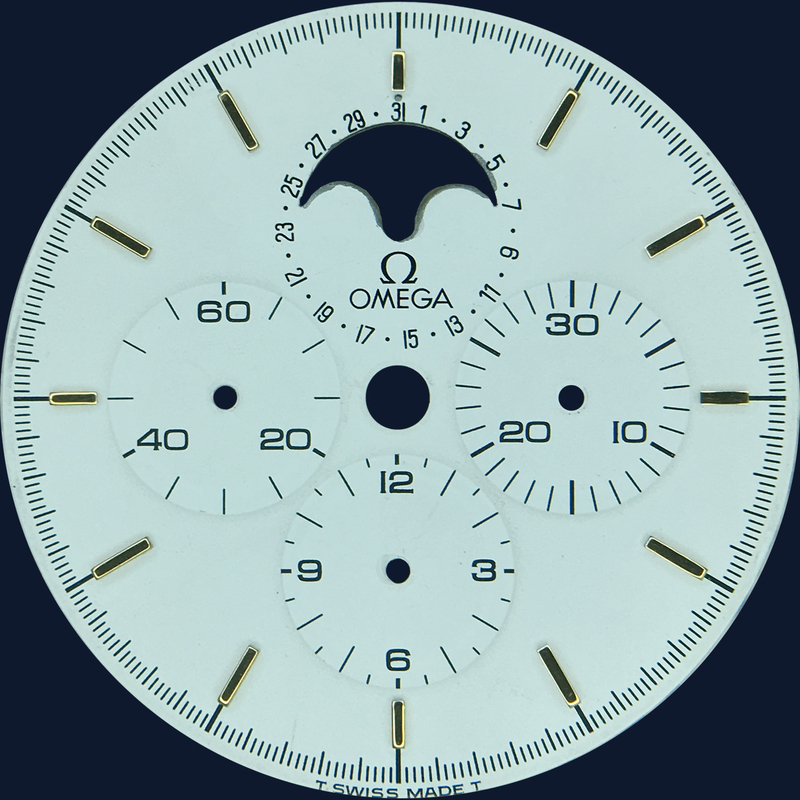 The prototype dial is identified by smaller stepped sub-dials, the lack of serifs on the date chaptering and it having no ‘Swiss Made’ on the dial. 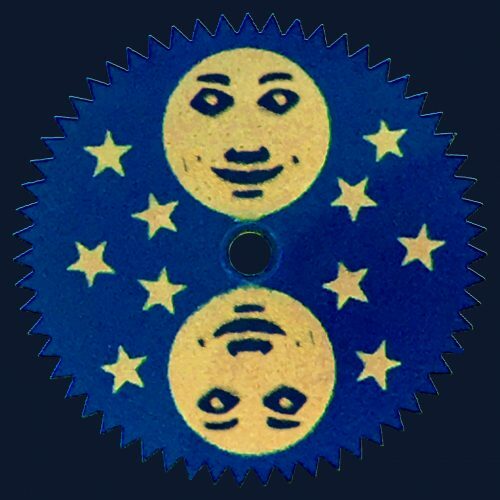 The first two are identical large moon discs which carry symmetrical 5 point star pattern. 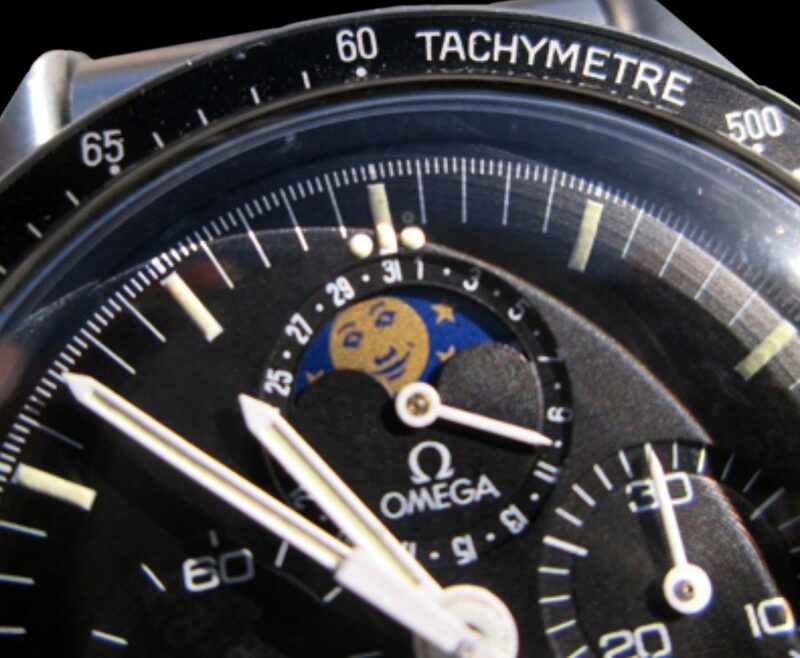 The 3rd one is much rarer small moon disc which carries an asymmetrical 4 and 6 point star pattern. 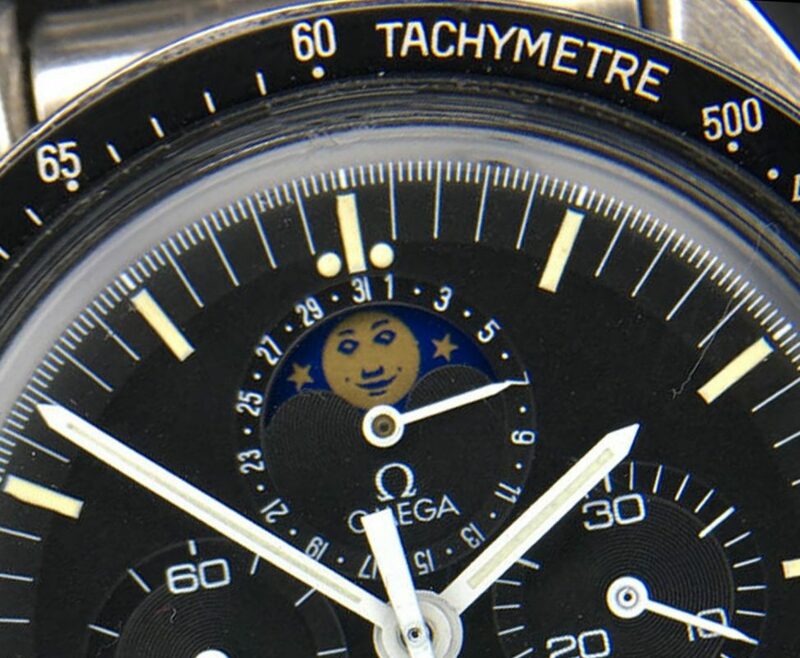 This is the very rare smiling moon variation, with maybe less than 25 in total. 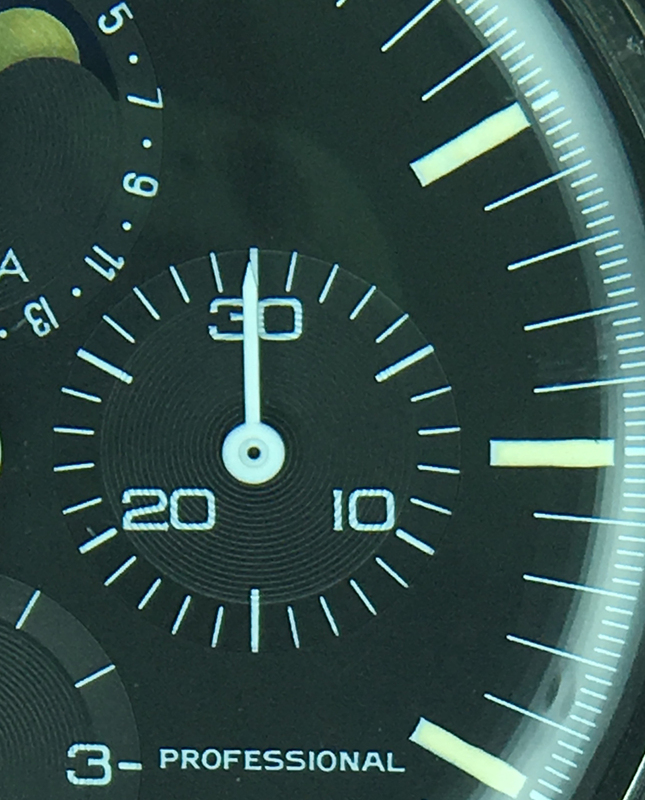 It’s worth noting that later models may have an hour hand with a slightly slimmer lume width as shown below. 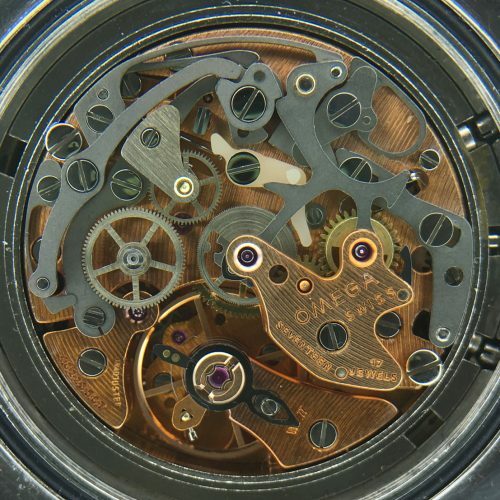 No prototyping of the movement was required as it was a Lemania Watch Orient 1883. The movement was a beryllium copper coated chronograph, as per Omega specification, with 17 jewels and shock protection. 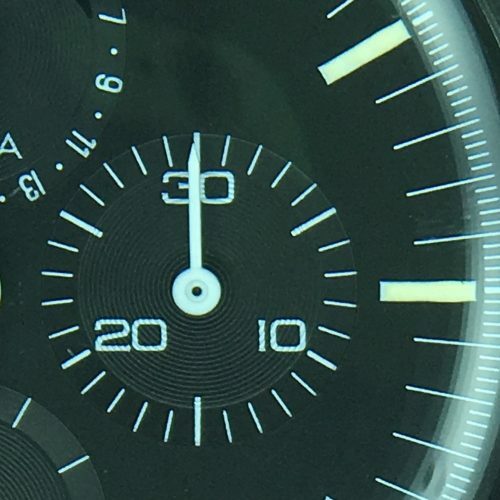 There were two batches of movement numbers; 44122xxx and 48223xxx. Each smiling moon was hand-painted and individual. The image above on the left shows a wider smile. 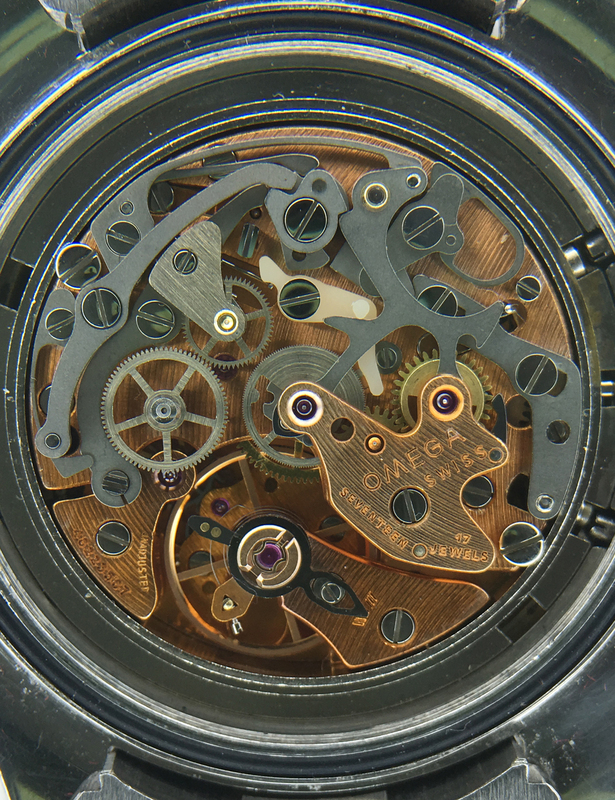 A typical Frankenstein watch; service dial, service hands and service case. 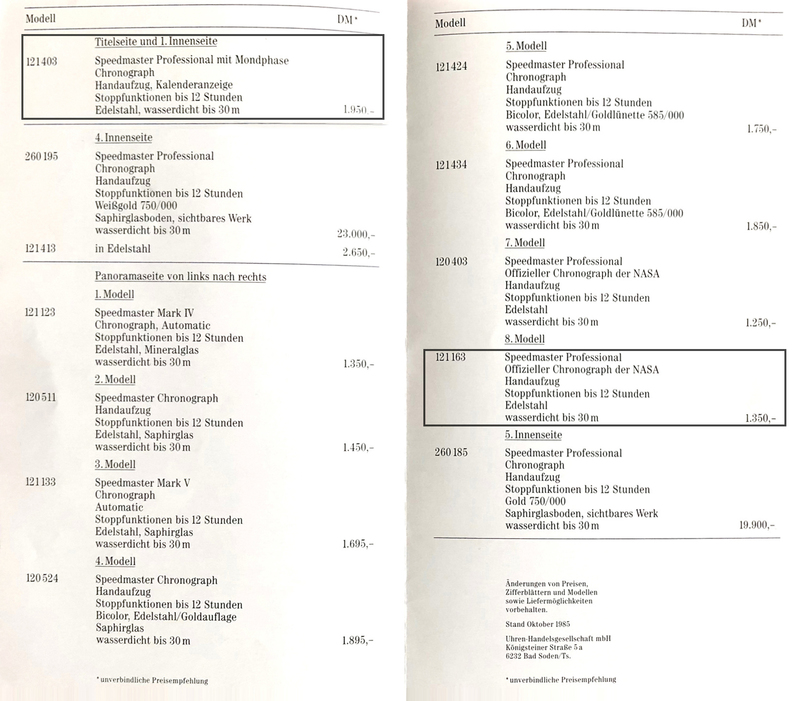 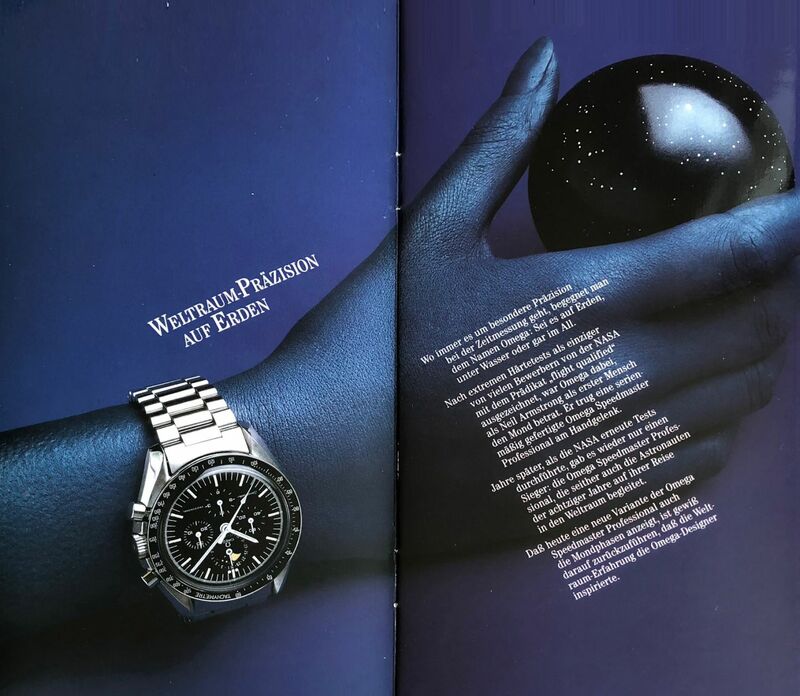 As can be seen from this German catalogue from 1985, the Speedmaster Professional Moonphase was at least 40% more expensive than the standard Speedmaster. 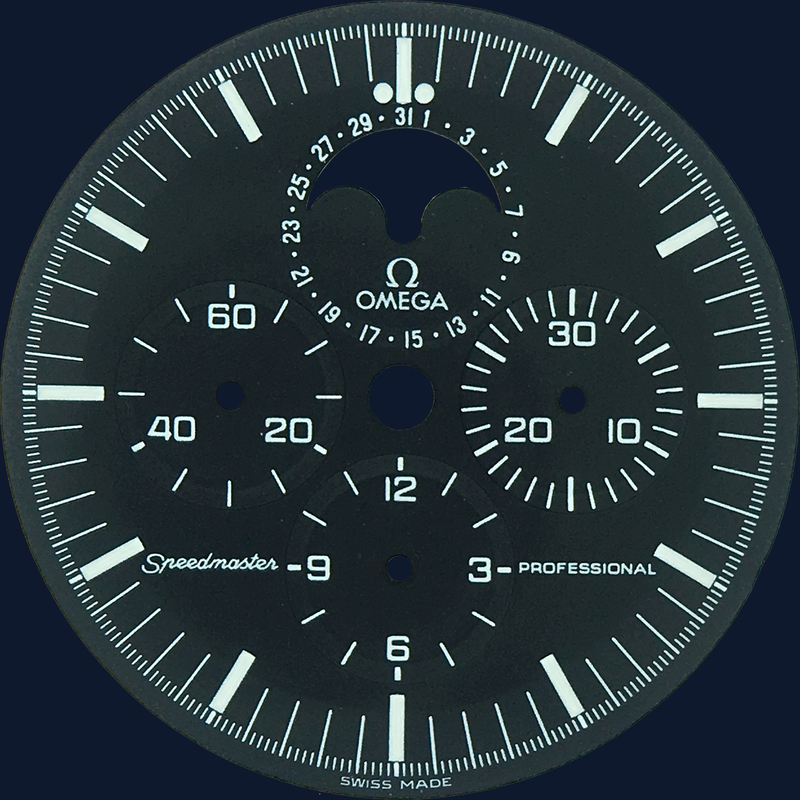 It was the most expensive steel Speedmaster Professional ever made at that time. It should be remembered that there are only 1100 watches on bracelets out there and that the three configurations are vastly different in price. 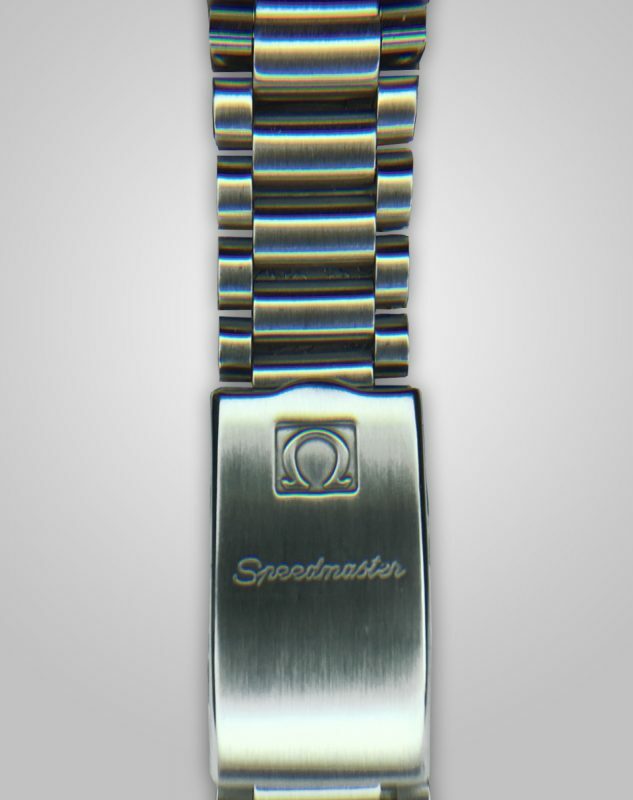 Please note that these prices are for the bracelet versions only. The strap versions are significantly cheaper and are at least 30% lower in value. Please be aware it is common to see strap versions being sold having been converted to bracelets so the collector must be wary of checking the case back to ensure that it is an original 345.0809 not a 145.0809. The author has seen numerous examples of case backs which have been altered or over printed by laser. 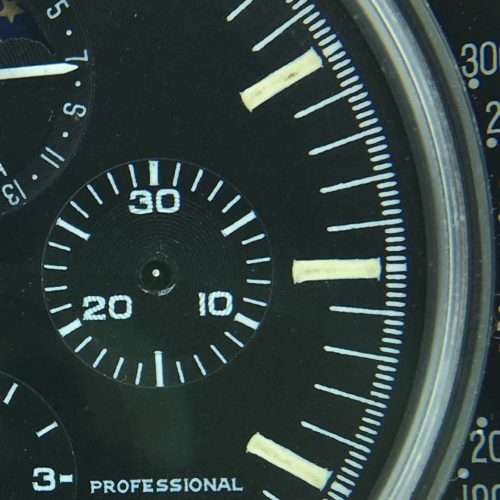 If in doubt please get in touch. 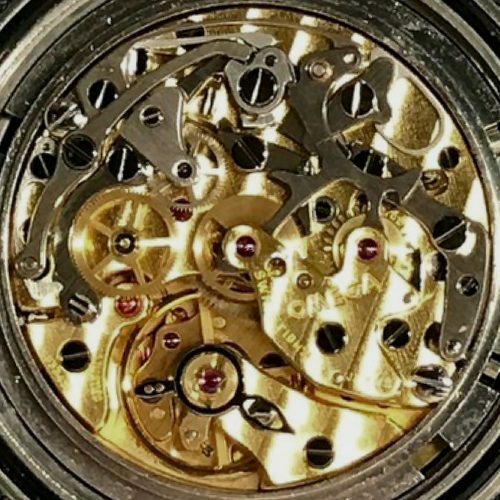 If a watch is offered at a price which is significantly lower than those above please be very cautious as there are a number of fakes and franken watches available. 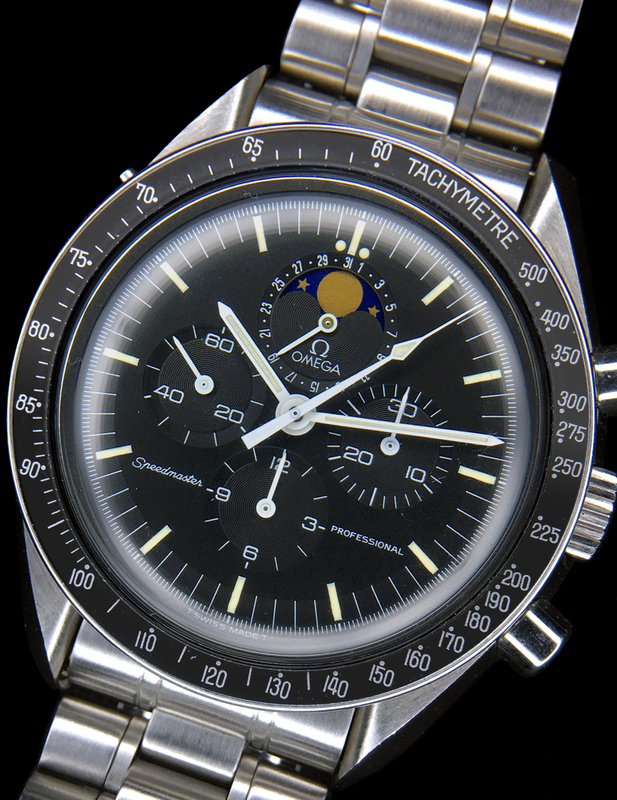 Particular thanks to @vintagewatchzilla, a very able collaborator, collector and generally acknowledged schnitzel King of Vienna.